At what point do we stop thinking it's cute, all the robots in the nurseries, and we start worrying about The Matrix and The Rise Of The Machines? Eh, not yet! 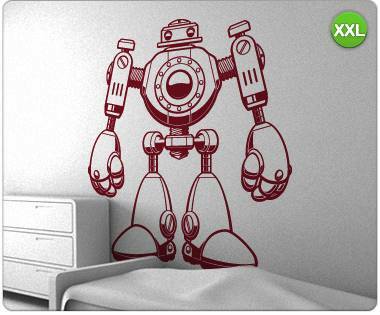 Just look at how cute this giant robot wall adhesive from e-glue is! It's Jojo of France, and she's here to help. French stickermaker e-glue sells Jojo in two sizes and ten colors for EUR85 or EUR135. Which gets me thinking: on the one hand, if the robots take over, wouldn't they get rid of this heinous EUR/USD exchange rate? On the other hand, species-wide enslavement. I don't know about you, but this is a harder choice than I expected. Jojo's much too cute. How about some Cylon Centurion stickers? That'll help the kid sleep.